baby’s got a new pair of shoes–two, in fact – Hi, I'm Caroline. Tim’s birthday was on the 8th (happy 26th, hon!) and then I got a surge of custom orders, so I’ve been absent from blog-land for the last few days, and I don’t think it’s going to slow up any time soon! I was lucky enough to be featured in yet another edition of Etsy Finds (thanks, Anda!) and have since found my sales at Calobee Doodles a little overwhelming. But overwhelming in a good way! 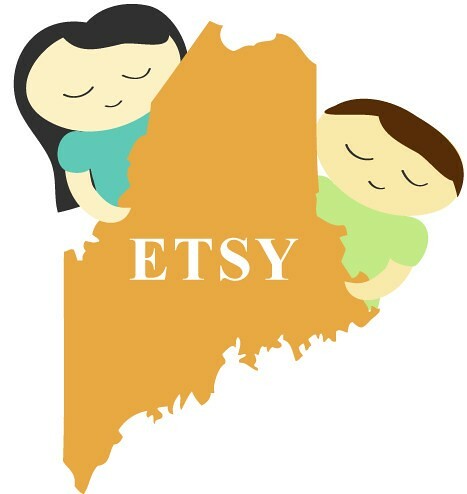 Speaking of Etsy, I’m quite excited about the upcoming EtsyMaineTeam meet-up this weekend in Augusta! The last meeting was snowed out and rescheduled to a time when I couldn’t make it, so I’m eager to catch up and meet everyone. On Tuesday evening we took a trip to Target, where I found not one but two pairs of cute shoes. This is amazing, because I haven’t bought a pair of shoes in a retail store in years (save for the occasional $5 flip-flops, and my annual trip to the Saucony outlet for new sneaks on-the-cheap) because they never fit. My feet are very short and wide and tall–a shape that pretty much rules out anything that has a pointed toe, or even the slightest hint of a pointed toe… in other words, anything that isn’t designed to be worn by a duck. In fact, every pair of dress shoes I’ve ever owned (that would be 2 pairs, mind you) in my adult life came out of a “special” mail-order catalog for people with ridonkulously weird feet. That’s right, folks, my feet are “special.” And now you know why I spend 99.9% of my time in sneakers. But my new shoes? They’re cute. And when I say cute, I mean, adorably perfect in every. single. way. They’re comfortable and stylish, dressy enough for the office but casual enough for weekend wear. I bought two pairs–one in the ribbon style, one in black–because I’ll probably never find any shoes so perfect ever again. In fact, I recommended them on ThisNext long before I’d seen them in person, so it must be fate! The shoe gods are smiling upon me. tall feet…hard to picture, but you made me laugh! Great job with the big sales! The calodoodles are calo-riffic–keep it up! So, why only two pair??!? I’d buy one in every color… maybe even two pairs of the same shoe so when the one pair gets old, I have a back up (this is a true story). You know, we’re all dying to see these feet now. oh wow, nice. i hate shoe shopping, i’d wear the same boring white sneakers for the rest of my life if they’d last that long just to save me the trouble. but when you do stumble upon that perfect pair of shoes, it’s the best feeling ever. who can blame you for buying two [or more 🙂 ]. 1. Link to the tagger. 2. Share 7 random or weird facts about yourself. 3. Tag 7 people, post their names and links to their blogs on your blog. 4. Tell the 7 people you tagged by posting â€œTag youâ€™re itâ€ on their blogs in their comments box and explain the rules to them. great shoes! I love the ribbon ones, the colours are gorgeous. And congratulations on all your sales too! Congrats on all the custom orders! Gotta say…I don’t even like ballet flats and I think those are stinkin’ cute! They’d go with everything!